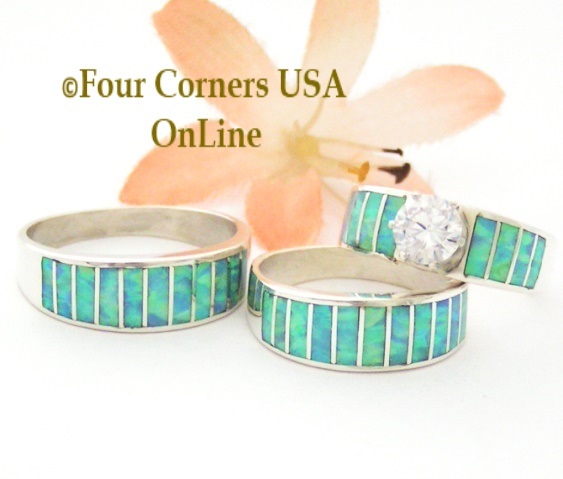 Brilliant reflective Blue Fire Opal Inlay Wedding Band Rings and Bridal Engagement Ring Sets with Round CZ offered by Native American Navajo Inlay Jewelry Artisan Ella Cowboy. Ms. Cowboy has a wonderful Contemporary styling exemplified by her precision channel inlay and each Bridal Engagement Ring is complimented by a round cubic zirconia in a quality prong setting for a more traditional solitaire ring.